MORDECHAI BEN-DAT SPECIAL TO THE CJN A Trial in Venice was published in March. About 100 kilometres almost directly north of Verona, in the lush verdant reaches of the central Alpine mountains of Italy, is the city of Trento, the capital of the Trentino region. Trento is small by modern standards. Some 100,000 people live there. It was smaller even in 1475, when an accusation of blood libel was leveled against the handful of Jews who lived there. In all, three extended Jewish families lived in Trento in 1475 – likely not more than 30 people. They had settled in Trento with the permission of the authorities and were allowed to practise their professions, one of which was medicine, the other, not surprisingly, moneylending. Compared to the majority of the townsfolk, the few Jews of Trento were relatively well-to- do. Some days before Easter that year, a fanatical Franciscan monk, Bernardino da Feltre, travelled through the town preaching hateful sermons about Jews. A few days later, the day before Easter, a two-year- old boy named Simenino went missing. The next day his mutilated body was discovered near the home of a Jewish family. With the monk’s wild, vile disparagements of Jews still ringing in their ears, the townspeople accused the Jews of their town of having killed Simenino to extract his blood for use in baking Passover matzot. 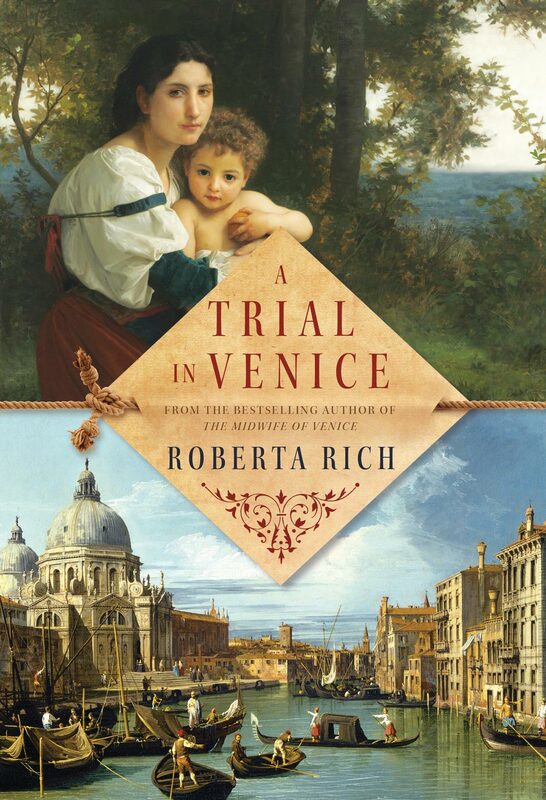 The blood libel against the Jews of Trento is the definitive dramatic centre of A Trial in Venice, Roberta Rich’s third installment in the stirring three-part historic fictional series chronicling the fate of Hannah Levi, a Jewish midwife from Venice. Hannah is a fictional character whom readers met some five years ago in the first novel in the series, The Midwife of Venice. In the second book, The Harem Midwife, Hannah’s story resumes in Constantinople in the Ottoman Empire where she has been appointed midwife to the sultan’s harem. In A Trial in Venice, the author brings Hannah’s harrowing adventures back to Venice. It is fitting that Hannah’s saga returns here. For the city itself – its unique watery setting, rich culture and entrenched legal traditions – plays a key contextual and backdrop role in the unfolding and resolution of Hannah’s fate. A Trial in Venice takes place in 1580, about 100 years after the murder of Simenino in Trento. The author masterfully recreates the ongoing hardships of life for ordinary Venetians. With equal mastery, she juxtaposes the poverty of life along the city’s fouled canals with the high privilege of the city’s pampered wealthy class in their nearby country estates. Indeed, the stark dichotomy between those who have so much and those who have so little takes hold of the mind and soul of one of the story’s main characters, relentlessly driving the sinister plotting against Hannah and her family. The author is also adept in depicting the stiflingly close conditions of life for the city’s Jews within the tightly confined quarters of the ghetto. The precise portraiture by Rich of the historic, physical and cultural atmosphere of time and place is one of the key features throughout the Hannah Levi trilogy and plays a large role in the charm of the trilogy. Like the two instalments that preceded it, A Trial in Venice features fast moving plot development and twists, and fully formed main characters who contend with unambiguous moral choices. The “good” people in the story, pre-eminent among whom is Hannah, are reliably decent and moral though also flawed. Hannah, for example, is courageous, resourceful, compassionate and deeply principled. But time and again her stubborn nature steers her toward trouble. The rogues in the story are fully bad. They are greedy, covetous and dishonest, without conscience, capable of murder. The story, again like its predecessors, is akin to a literary made-for- tv movie. The pace is quick. Events unfold in short spaces of time and in tightly framed moments of action. Hannah follows her instincts for good. By doing so, however, she becomes ensnared in a thick spider’s web of deceit and physical peril. The predicaments are harrowing. The escapes are a relief. There are few lofty flourishes of evocative, elegant literature in the book. But inspirational prose was likely not the author’s main intention. Her intention was to create a tale of suspense, intrigue and malevolence against an accurately depicted period tableau of life for Jews in mid-renaissance Venice. And in this she certainly succeeds.